In Part 1 of this series I provided an overview of inflammation in the body. In this part, I’ll cover the research on various diseases apparently related to inflammation. In Part III, I’ll talk about the key to successful aging and what you can do to fight chronic inflammation. In Part 1 of this article I talked about the relationship between a “highly processed, high-fat, high-sugar meal” and inflammation in our bodies. I also mentioned how the medical community is beginning to focus more on the role of such inflammation in different diseases. I mentioned that in an article in the July 2017 issue of Mayo Clinic Health Letter, Brent Bauer, M.D., noted several diseases in which inflammation may or does play a part, including: rheumatoid arthritis, lupus, polymyalgia rheumatica, asthma, cancer, and inflammatory bowel diseases. While treatment options tend to vary for these conditions, none has a cure. However, research indicates there is one thing we can all do to decrease our chances of getting these diseases or improving our symptoms: eat fewer animal products (or avoid them altogether). The following information is specific to rheumatoid (inflammatory) arthritis. The inflammatory reactions of arthritis appear to trigger when susceptible people put animal proteins in their body. Their immune systems react by producing antibodies to the animal product but attack their own bodies instead. For example, when you eat animal cartilage your body instead attacks your own cartilage. That’s called meat-induced joint attack. Crohn’s disease is an inflammatory bowel disease in which your body attacks your own intestines. It affects more than a million Americans. There is no cure. Research focuses on controlling symptoms. The summary from Part 1 of this article and the research noted here is that a diet low in processed food can decrease inflammation in your body and lower your risk of inflammatory-based diseases. At the same time, a diet high in whole plant foods such as fruits, vegetables and whole grains, can improve symptoms if you already have one or more of the diseases and decrease your risk even further if you don’t. While the link between diet and inflammation is becoming clearer, there is still much to be learned. Meanwhile, the evidence seems to support consumption of whole grains, vegetables, fruits and legumes for better health. So, the next time you’re out, grab a salad, add some legumes and whole grains, and hold the high-fat dressing. J. McDougall, B. Bruce, G. Spiller, J. Westerdahl, and M. McDougall. Eﬀects of a very low-fat, vegan diet in subjects with rheumatoid arthritis. J Altern Complement Med, 8(1):71-75, 2002. Am J Clin Nutr. 1999 Sep;70(3 Suppl):594S-600S. Rheumatoid arthritis treated with vegetarian diets. 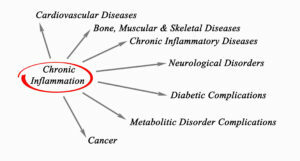 Kjeldsen-Kragh J.
NutritionFacts.org. Accessed September 22, 2017. J K Hou, B Abraham, H El-Serag. Dietary intake and risk of developing inflammatory bowel disease: a systematic review of the literature. Am J Gastroenterol. 2011 Apr;106(4):563-73. S Bandzar, S Gupta, M O Platt. Crohn’s disease: a review of treatment options and current research. Cell Immunol. 2013 Nov-Dec;286(1-2):45-52.